Her stunning order placement was anything but ordinary. "What can I get for you today?" a McDonald's drive-thru attendant in Conway, South Carolina, casually asked 16-year-old Cecily Hennigan on an ordinary Wednesday evening. But the teen's stunning response was anything but ordinary as she beautifully sang her own rendition of Todrick Hall's "McDonald's Drive-Thru Song." Hennigan's video has since gone viral, with over 100,000 views, 2,300 shares and 304 comments on Facebook. "I'm about to do the McDonald's song and see what they say," she said to the camera as she excitedly prepared to sing the YouTube star's ode to ordering to the drive-thru attendant. "I have a pretty long order because I have a lot of people, so just bear with me..." she said. Then, she started to sing — and her voice is absolutely gorgeous. "Well, I want a number six super-size with the Sprite and large fries, mustard, ketchup only please, but don't you forget the cheese," she started. "I got a sweet tooth, I'm in a hurry, can I get one small McFlurry ..."
Hennigan and her friends laughed with excitement after she completed her version of Hall's tune. "That was good ...," the drive-thru attendant said after a pause. Hennigan said thank you and drove off while she and her friends continued to giggle ... and eat their McDonald's french fries. Soon after Hennigan posted the video on Facebook, the social media love started to pour in from people who marveled at the stunt and her beautiful singing voice. "Keep posting videos so we can hear that beautiful voice!" "That was awesome!! I'm lovin' it!!" and "Love everything about this, SO cute!" were just a handful of the supportive comments that people made about Hennigan's singing. On Friday, Hennigan posted another video in which she thanked her new fans for the "wonderful feedback" and explained her inspiration for the impromptu performance of Hall's song. "I just loved it when I was a kid," she said. "I just happened to memorize the words and when I was at McDonald's the other night, it just kind of happened. It was a spur-of-the-moment thing." Then, she asked people to keep sharing and liking the video because she said she hoped "to go on 'The Ellen Degeneres Show', if I can." Hennigan is also a fan of the TODAY Show and came to New York City for OneRepublic's performance on the plaza on July 13. She even snagged a photo with Hoda Kotb! Hall's original video went viral with over 10 million views on Facebook in 2010. A former "American Idol" contestant, Hall now has almost 3 million fans on his YouTube channel. "This was my first viral video and I am so flattered and honored for it to be seeing a second life with this talented young vocalist," Hall told TODAY Food. 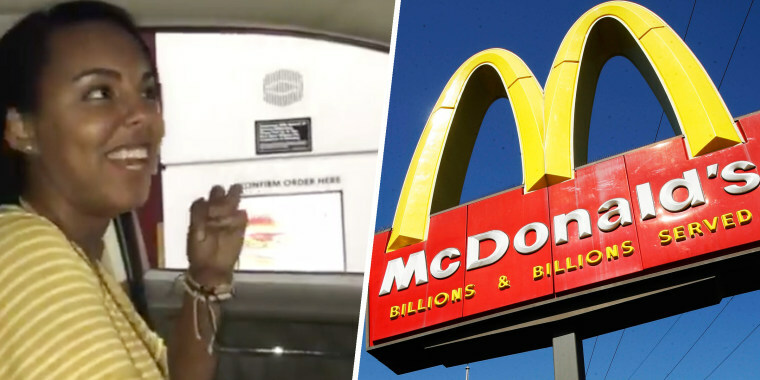 After the success of his original "McDonald's Drive-Thru Song," Hall created several more videos of his McDonald's orders. Here's hoping Hennigan covers them too! Hoda talks about highlights from her birthday, including Haley Joy singing to her!